Adaptil is a chemical copy of the dog appeasing pheromone (D.A.P.) released by a mother dog from her mammary area after her puppies’ birth. It’s involved in the attachment process between the mother and her offspring. This pheromone is a comforting message providing a strong signal of security to puppies as they explore the world and face so many challenges. Adaptil has been proven to provide reassurance to puppies and dogs of all ages, helping them feel safe and secure when encountering new experiences, unknown environments and other stressful situations. Adaptil diffused in the proximity of a dog mimicks the natural dog appeasing pheromone, as a reassuring message. As a consequence, it helps prevent or control stress or fear-related behavioural signs. The Adaptil Collar is an easy to use and convenient way for your dog to experience the calming effects of the Dog Appeasing Pheromone, as it releases the dog appeasing pheromone constantly (even when the dog is outside). The dog’s body temperature and close contact warm the collar and encourages the diffusion of pheromones into the local environment. 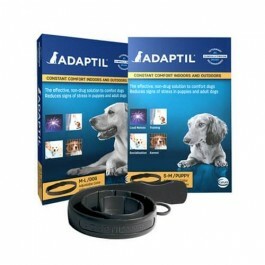 It is essential the Adaptil Collar is in close contact with the dog’s skin at all times. Ensure the collar is fixed inside the buckle Cut off the excess portion of the collar Note regarding puppies: as the puppy grows, it’s important to regularly adjust the fit of the collar to make sure it’s not too tight. 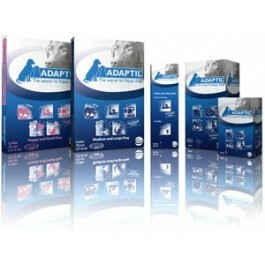 The Adaptil Collar is proven to work on all breeds of dog, as long as it is fitted correctly. The appeasing pheromone is released almost immediately. 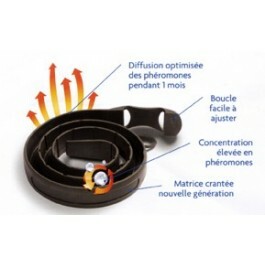 The Collar will not work when it is wet, but diffuses again as soon as it’s dry. If your dog wears another collar, it is important to ensure the Adaptil Collar stays in contact with the skin. Please note the Adaptil collar cannot be used to attach a leash. Do not use the collar on dogs with extensive skin lesions. Do not open the protective pouch until the product is ready for use.